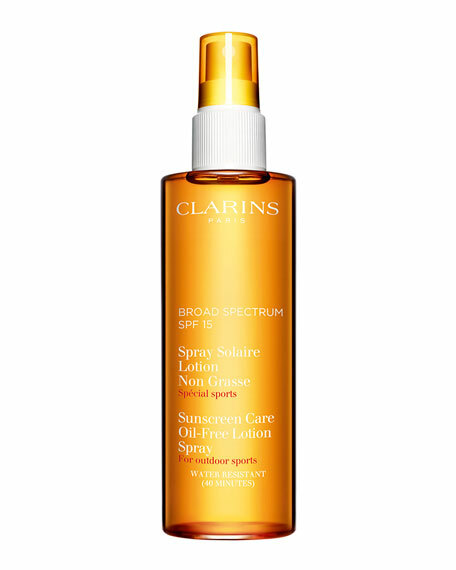 Non-oily and invisible on the skin, this spray-on sun treatment is suitable for combination or oily skin types. Great for men with a texture that is ideal for hairy parts of the body. Promotes a natural and radiant-looking tan. Ensures reinforced sun protection (heat-resistant UVA/UVB filters). Multi-cellular protection and anti free radical. Note: This product contains alcohol and should not be applied to children's delicate skin. In 1964, Jacques Courtin-Clarins developed his Institut face and body treatment methods, along with his unique Clarins treatments. Made exclusively from plant extracts, this innovative line is famous for revitalizing and firming the skin. Today, Clarins continues its tradition of excellence with a collection that includes skincare, cosmetics, fragrance, and sun and body care.